Decorative wrought iron rails and railing for decks, patios, gardens, ornamental, artistic, sundeck, al fresco. The Stub Wall Rail was designed to replace stub walls in Bi-Level homes, thus adding the class of wrought iron and making the room appear much larger. Even thought the cost of the railing is less that the cost of a wall, the quality of this railing is beyond belief and will satisfy the most discerning taste. 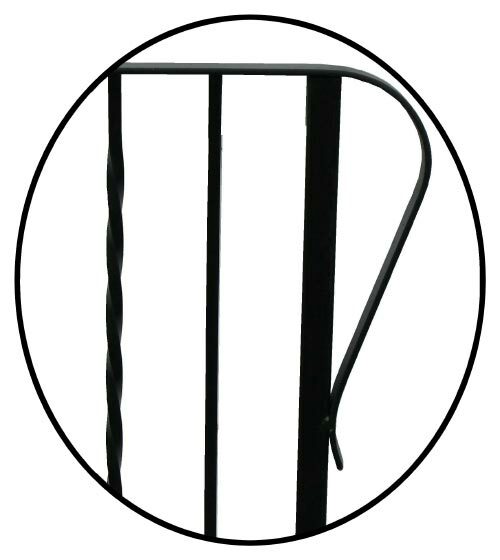 The Stub Wall Rail is available in both the 36 and 42 inch high models. Check with your building inspector to see which is required for your situation. The "Stairwell Protector" was designed to protect two sides of your stairwell opening. You will receive two sections of railing that bolt together at the corner - they will go either left or right from the main railing. This railing is available in both 36 & 42 inch high models. Check with your building inspector to see which height you require. As with all ARTISTIC RAILINGS, you may add "Bolt in Designs". They bolt to the existing bars in the railing. Looking at the floor plan above, if "C" is 36 inches and "A" is 96 inches - the cost for the two railings would then be $300.30 (for 36 inch high) or $338.80 (for 42 inch high) - plus freight. PLEASE CALL FOR YOUR EXACT COST & FREIGHT. ARTISTIC WALL RAILS are manufactured with a bottom rib for extra strength. This rib allows you to bolt on the wall brackets wherever required so that you hit the studs in the wall. The pictures below show the two types of wall rails. The difference is only the ends - a Looped End or a Regular Curled End. 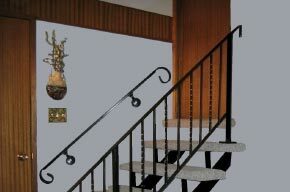 These wall rails are primed black and may be painted any colour with an enamel paint. They are available in lengths starting at 2 feet and then every 6 inches after that up to 20 feet. Wall Brackets are sold separately and should be placed every 36 to 40 inches along the wall rail. To order a WALL RAIL measure the distance from the edge of the top floor down to the tip of the bottom step. ( See "B" in Picture A above. You then go to the nearest ft. or half ft.) EG. : Measurement "B" is 52 inches - you would order a 4½ ft. wall rail and two wall brackets. The length would be the measurement "A" in Picture B. These Wall Rails cost $7.70 per foot and the Wall Brackets cost $6.60 each and come with self drilling & tapping screw - freight is extra. 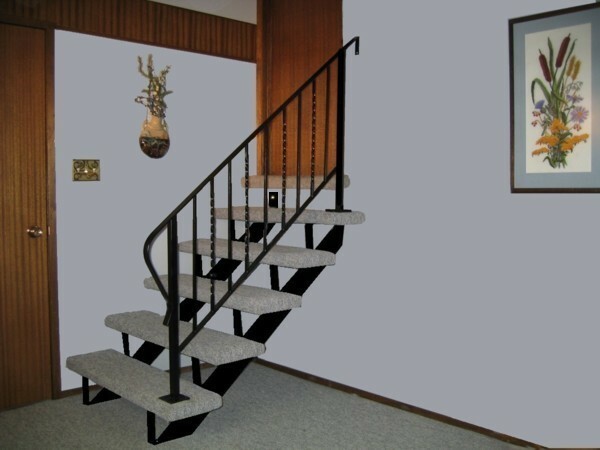 ARTISTIC DELUXE STAIR STRINGERS & RAILINGS have become very popular in new home construction and remodeling and because of this increasing demand - we have now extended our line to cover many more situations you may encounter. A. 7 Inch Risers with 11 Inch Tread ( Treads have ½" Overlap ). B. 7½ Inch Riser with 11 Inch Tread ( Treads have ½" Overlap ). C. 8 Inch Risers with 9 K Inch Tread ( Treads have ½" Overlap ). 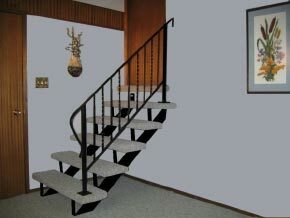 Railings are made to fit the above DELUXE STAIR STRINGERS . Check approx. pricing on our stair stringer page. PLEASE CALL FOR YOUR EXACT COST. 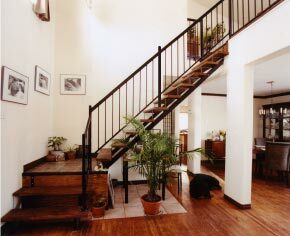 In the situation to the left, the customer used a set of "10S1-I" and a set of "2S1-I" Deluxe Stair Stringers to build the stairway. Then the job was finished off using our Slip & Lock Railings. You can learn more about these products by going to our DELUXE STAIR STRINGERS and our SLIP & LOCK RAILING pages.